Union signatory contractor Allegheny Contract Flooring has produced a video promoting its new concrete finishing system. 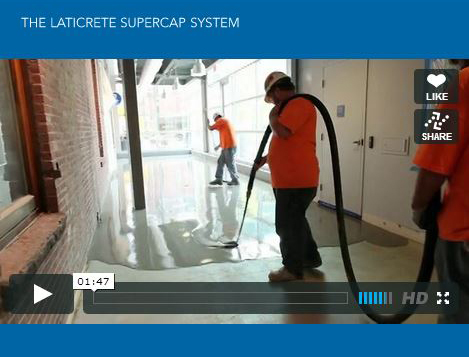 The “Supercap” system allows for time and cost savings for work on new or existing concrete slabs. The system also takes advantage of Greenguard certified, low alkali technology to contribute toward LEED status. Members of Floorcoverers Local 2168 are working with Allegheny and the Supercap system to improve quality and sustainability while shortening construction schedules and saving projects money. Click here or on the image, above, to watch the video on Alleheny's website. Best of luck to Manafort Brothers and the union carpenters employed on their projects as the company expands their presence with a Worcester office. Click here to read more. Thanks to Chris Marzullo, a Local 26 member working as a Foreman for G.O. Services. Brother Marzullo sent us pictures of a pole barn they're building for the new Essex Agricultural School in Danvers, Massachusetts. The new school building itself is being built by union carpenters employed by Gilbane and their subcontractors. The pole barn is one of several out-buildings that are or will be completed as part of the project. Because he was an independent contractor, Anderson was unable to collect workers compensation. He had become an independent contractor, he said, because his employer, Dave & Marty Inc. of Michigan, had said it was the only way he’d be able to continue working with the company." Click here to watch a carpenter and a contractor testify at the hearing. The Boston Globe today published an opinion piece by Mark Erlich, Executive Secretary-Treasurer of the New England Regional Council of Carpenters. Boston Mayor-elect Marty Walsh was labeled as the union candidate early in the race. Columnists and debate moderators manufactured a perspective that Walsh’s labor affiliation was his candidacy’s albatross. 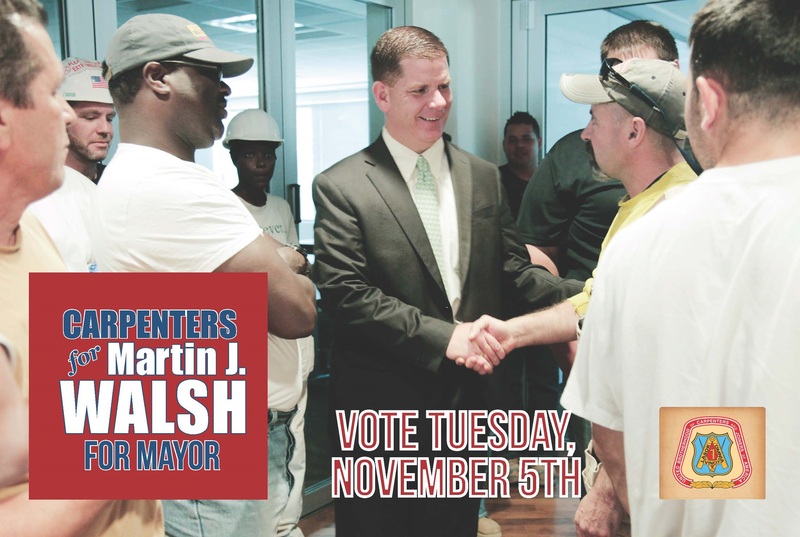 Walsh does have a strong personal and family union background and recently served as the head of Boston’s building trades unions. But he had also been a state representative for 16 years with a legislative record on a full array of public policy issues. Registration for the complimentary seminar "Planning for Retirement," to be held on November 16, 2013, is now closed. A record number of respondents registered for the event - nearly 130! 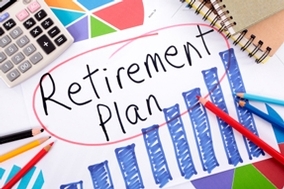 The New England Carpenters Benefits Fund will be planning a 2014 Retirement Seminar Series, check back for updates. Buoyed by the support of a broad coalition that included union workers, minority communities, small business owners and middle class residents, State Representative Martin J. Walsh was elected Mayor of Boston last night, defeating City Councillor John Connolly. Walsh will succeed the enormously popular Thomas Menino, who is the city's longest serving mayor. The following statement is from Mark Erlich, Secretary-Treasurer of the New England Regional Council of Carpenters, which endorsed Walsh in both the primary and general election. Erlich is also a Boston resident. "Last night, Marty Walsh was elected to serve as the next Mayor of Boston. Marty's victory has implications far beyond the city's borders. Boston is, in many ways, the primary economic engine of New England and the leadership at City Hall sets the tone for the regional development and construction industry. For the past 20 years, Mayor Tom Menino has been a staunch ally of construction's union sector and his stance has helped our members find gainful employment in Boston and beyond. "Marty's election will only serve to further elevate the profile of unions in our region. As a building trades leader who spoke proudly of his involvement in the labor movement, his victory flies in the face of the prevailing political winds that dismiss or attack the value of unions in today's society. Marty had to withstand withering attacks in the Boston media that claimed he would bankrupt the city by not being able to stand up to the city's public employee unions. Marty never backed down from his loyalty to organized labor as the best vehicle to re-build the middle class in the city. "This election has national implications. While there have been a few Senators and Congressmen that have been clear about their pro-union beliefs, it is far more rare to find someone running for an executive position -- Mayor or Governor -- who doesn't feel the need to criticize unions in an effort to show they are "fiscally responsible". Marty made it clear that you can be committed to running a sound budget in a major American city and still maintain respect for trade unions. "Marty was also able to win the support of nearly all of the elected officials from the city's minority community, demonstrating that today's labor movement is welcoming, diverse, and inclusive. Marty is a personal friend of ours, a friend of the Carpenters, a friend of labor, and a friend of all those people who want to work, play by the rules, and have a chance at the American Dream. Thanks to everyone who worked to get Marty Walsh elected. It can be the beginning of a new era for labor and politics." Boston voters will go to the polls on Tuesday to elect a new Mayor and City Council. Many of these race extremely close, so we urge you to vote and encourage others to vote. If possible, be active on election day in support of candidates endorsed by the Carpenters union. Members will gather for election day activity at 11 am at a location nearest their home. Locations are listed below. Unions and union members are good for communities. Aside from all of the obvious economic reasons this is true, it's clear when union contractors and members team up to have a lasting impact on friends and neighbors like they have this past week in Swampscott. After hearing that a contractor had walked away from an unfinished renovation job with a family's money, union contractor Brait Builders stepped forward. Bob Brait and his brothers learned about Sam Paster, a 16-year old boy with cerebral palsy. His parents had saved for years to renovate their home to accommodate Sam, who is in a wheelchair. They wanted him to have a level of independence now and in the future, when they were no longer able. Brait Builders and union carpenters volunteered their time and skills without hesitation. Now Sam will have greater independence. The Pasters will have peace of mind. Brait Buidlers and union carpenters will remember a wonderful experience. Friends, family and neighbors of the Pasters will know that, despite some bad characters, the construction industry has some really good people ready to step forward and help their community. The story was covered by WCVB, Channel 5 as well as New England Cable News and CBS Boston, WBZ Channel 4. An event was held yesterday to celebrate the start of a major revitalization project happening in Dorchester’s Quincy Corridor. Boston Mayor Thomas M. Menino joined U.S. Department of Housing and Urban Development (HUD) Secretary Shaun Donovan to celebrate the project, which is funded by a first-in-the-nation Choice Neighborhood Initiative grant. Members stand with Boston Mayor Tom Menino and HUD Secretary Shaun Donovan at an event held at the Quincy Street Corridor Redevelopment Project. Project Developer Dorchester Bay EDC and the City of Boston's Department of Neighborhood Development received $20.5 million through HUD’s Choice Neighborhoods Initiatives grant program. Boston was one of five cities nationwide to receive the first-ever Implementation Grants. At the start of the event, Jeanne Dubois from Dorchester Bay EDC raises her arms to celebrate the work being done by union carpenters on the project. The project will include redevelopment of the distressed Woodledge/Morrant Bay HUD-assisted housing development, community improvements such as community facilities, parks, gardens, economic development, job creation and asset building, and supportive services for residents of Quincy Heights and the surrounding Quincy Street corridor. Retirement Seminar to be held - register today! The New England Regional Council of Carpenters and the New England Carpenters Benefits Funds are hosting a complimentary seminar “Planning for Retirement” on November 16, 2013. The seminar will be held at the Wyndham Boston Andover Hotel located at 123 Old River Road in Andover, MA (click here for directions) from 8:30-11:30 am. RSVP by November 1st by clicking here to fill out an online registration form. Members can also register by calling 617-482-4000. Click here to find more information about the seminar, including the online registration form. Photos courtesy of Ron Rheaume, Local 1305. Learn more about the Marine Commerce Terminal Project by clicking here to view it in our online portfolio. The 2013 Carpentry Expo was held last week at the New England Carpenters Training Center in Millbury, MA. Over 1,000 students, representing 43 high schools attended the event. Students, along with their teachers, were given guided tours of the training facility by members of the NERCC staff. 44 NERCC apprentices participated in the event working on projects throughout the facility. These live demonstrations gave the students a better look at what a career as a union carpenter might look like. Live demonstrations included: Infection Control Risk Assessment, Interior Systems, Flooring, Residential Wood Framing, Scaffolding Erector Certification, Cabinet Installation, Door Hardware, Finish Carpentry, Welding, Concrete Formwork, Insulated Concrete Forms, Pile Driving, Under Water Welding, Exterior Siding, and Stair Layout and Framing. Following are results from today's elections for positions on the New England Regional Council of Carpenters Executive Board. The elections were held as part of a Special Call meeting of Delegates to the New England Regional Council of Carpenters. Nominations were posted on this blog earlier in the day. Executive Secretary-Treasurer: Mark Erlich, unopposed. One vote was cast by the Chair. Erlich elected. President: Richard Monarca, unopposed. One vote was cast by the Chair. Monarca elected. Vice President: Al Peciaro, 75 votes. Rick Anderson, 24 votes. Peciaro elected. Warden: Jack Donahue, unopposed. One vote was cast by the Chair. Donahue elected. Conductor: John Murphy, unopposed. One vote was cast by the Chair. Murphy elected. Trustees (Three positions): Brian Richardson, 84 votes. David Palmisciano, 66 votes. Paul Lander, 63 votes. George Meadows, 35 votes. Paul Hughes, 24 votes. Richardson, Palmisciano and Lander elected. Thomas Flynn, Bruce Lydem, Gary DeCosta, John Leavitt and John Cunningham ran unopposed. One vote was cast by the Chair. Flynn, Lydem, DeCosta, Leavitt and Cunningham were elected. Mark Erlich, Local Union 40, nominated by Dan Kuhs, Local Union 56. Seconded by Bill Callahan, Local Union 24. Richard Monarca, Local Union 24, nominated by Andy Hendrickson, Local Union 24. Seconded by John Murphy, Local Union 33. --Al Peciaro, Local Union 33, nominated by Brian Richardson, Local Union 56. Seconded by Michael Robinson, Local Union 24. --Rick Anderson, Local Union 624, self-nominated. Seconded by Joe Power, Local 40. --Local Union Jack Donahue, Local 107, nominated by Ray Bissonnette of Local Union 107. Seconded by Fred Taylor, Local 107. --John Murphy, Local Union 33, nominated by Tom Flynn, Local Union 67. Seconded by Richard Monarca, Local Union 24. --George Meadows, Local Union 43, nominated by Bill Baker, Local Union 43. Seconded by Tim Moriarty, Local Union 43. --Brian Richardson, Local Union 56, nominated by Ted Duarte, Local Union 210. Seconded by Mynor Perez, Local Union 2168. --Paul Lander, Local Union 94, nominated by Chris Shannon, Local Union 67. Seconded by Mike Antunes of Local Union 94. --David Palmisciano, Local Union 94, nominated by Bill Holmes, Local Union 94. Seconded by Richard Monarca, Local Union 24. --Paul Hughes, Local Union 218, self-nominated. Seconded by Jeff Donahue, Local Union 218. --Thomas Flynn, Local Union 67, nominated by Victor Carrara of Local Union 67. Seconded by Brian Richardson, Local Union 56. --Gary DeCosta, Local Union 1305, nominated by John Cunningham, Local Union 210. Seconded by John Cabral, Local Union 1305. --John Leavitt, Local Union 1996, nominated by John Murphy, Local 33. Seconded by Jim Carey, Local 275. --John Cunningham, Local Union 210, nominated by Gary DeCosta, Local Union 1305. Seconded by Ted Duarte, Local Union 210. 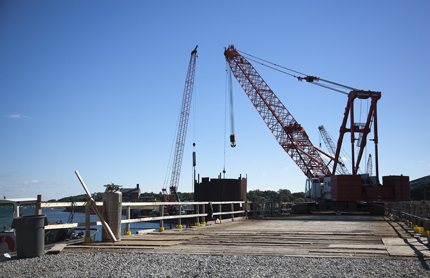 Learn more about the Fore River Bridge Replacement Project by clicking here to view it in our online portfolio. More than $21 million has been collected from employers in Massachusetts who violated labor laws in the last 18 months, according to the annual report of the Joint Enforcement Task Force on the Underground Economy and Employee Misclassification. The amount represents more than the total that was recovered in all previous years. The joint task force was created in 2008 and was a welcome development to union carpenters and others who had been working to bring attention to the issue of misclassification. Tens of millions of dollars in state and federal revenue are lost each year due to employee misclassification while employers who play by the rules are put at a competitive disadvantage and workers are stripped of essential protections such as workers' compensation coverage and eligibility for unemployment insurance, Social Security and Medicare. The issue is especially acute in the construction industry, where the fairness of direct competitive bidding can easily be undermined by a bidder misclassifying employees as independent contractors to save 20-30% on labor cost. Perhaps the largest recent case involved more than $1.1 million in unreported wages found at the renovation of the Boston Marriott Copley Place, where one contractor was paying $4 an hour to employees who were recruited from a substance abuse program in Connecticut. Contractors were issued more than $100,000 in fines on the project. "The work of the Task Force is invaluable in reducing the growth of the underground economy in the state's construction industry," said Mark Erlich, Executive Secretary-Treasurer of the New England Regional Council of Carpenters. "Taking on the illegal practices of wage theft, misclassification and tax and insurance fraud creates a more level playing field, which ultimately benefits legitimate employers, tradesmen and women and taxpayers." The joint task force brings together various state agencies, including the Executive Office of Labor and Workforce Development, the Attorney General's Fair Labor Division, the Insurance Fraud Bureau and others. Both the Boston Globe and the Boston Herald covered the issue. The city council of New London, Connecticut has approved an ordinance that will require contractors bidding for city construction projects valued at more than $1 million to hire local workers and provide apprenticeship training. New London Mayor Daryl Justin Finizio has pledged to sign the ordinance when it reaches his desk. The ordinance was proposed by the New England Regional Council of Carpenters and publicly supported by members and NERCC Business Representative Chris Bachant. It passed the Administration Committee before winning a vote of the City Council the following week. "This ordinance allows a percentage of workers from New London or New London County be required to work on a job,'' Bachant told the New London Day. "And any company working on a city project must comply with the Connecticut apprenticeship program. This is an opportunity. It's not just a job. We're offering a career." There was opposition to the ordinance among the city council and from the editorial page of New London Day. Following the vote of the full city council, Mayor Finizio published an opinion piece in the Day rebutting criticisms of the ordinance and restating his support. "Low bidder rules for construction projects, without the protections that this ordinance provides, favor the success of bids that use lower quality and less trained workers. 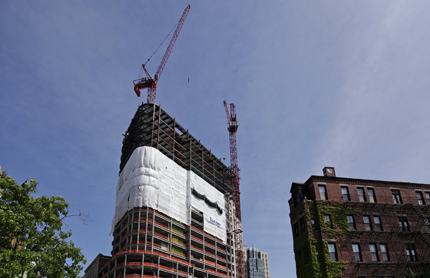 While a bid awarded may, in today's dollars, be less than a union construction bid, the buildings built are not of the same quality," Finizio wrote. "A responsible contractor ordinance, combined with appropriate budgeting for routine maintenance, will lower costs to city taxpayers in the long term by building, and maintaining, better quality buildings." 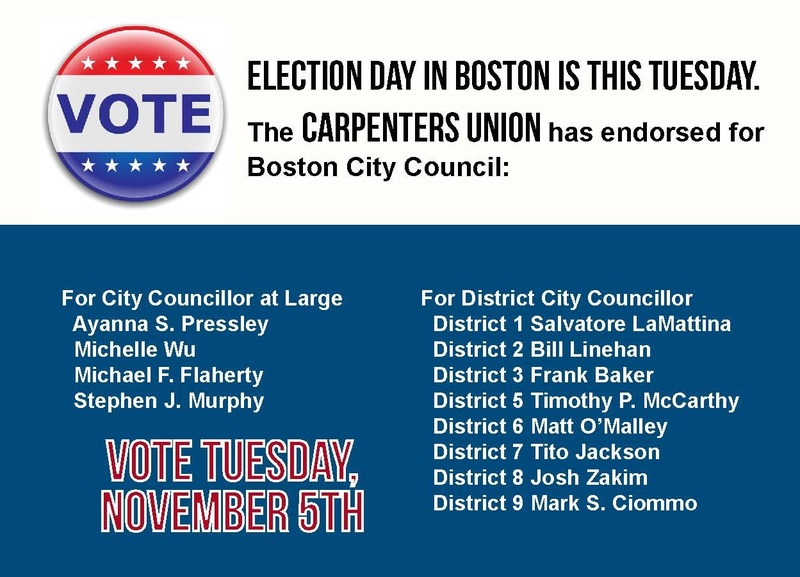 September 9th, 2013 – Boston, MA - The New England Regional Council of Carpenters (NERCC) and Boston’s Local 26 (UNITE HERE) are pleased to announce their joint endorsement of several Boston City Council candidates. The endorsement is a product of the two organizations, representing over 26,000 workers, jointly interviewing City Council candidates over a series of days. “This is more than just an endorsement of candidates for Boston City Council – this is two organizations that represent the diversity of Boston ensuring that working families will have a voice at City Hall. These are the leaders who have proven they can build strong communities,” said Brian Lang, President of Local 26 and resident of Jamaica Plain. "We came together to consider the candidates as two unions with progressive and independent traditions. 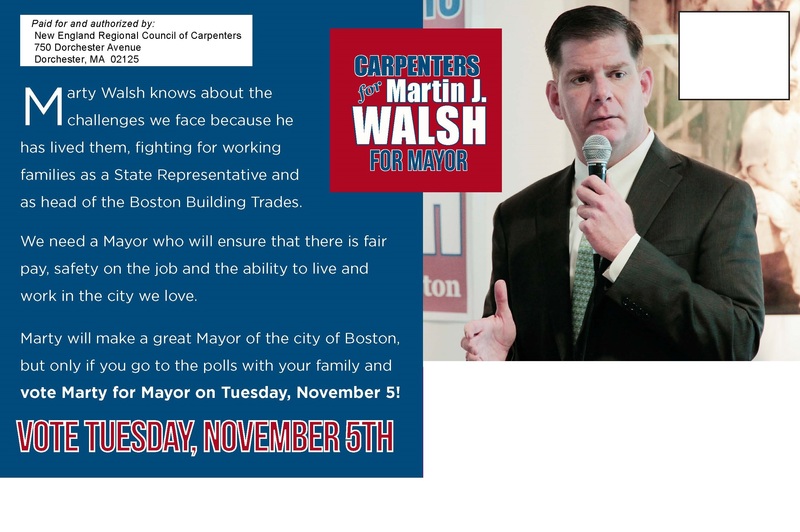 Our joint endorsements matter because, between us, we represent the full range of working families in the city," said Mark Erlich, President of the New England Regional Council of Carpenters and resident of Jamaica Plain. The two organizations are proud to support incumbent Councilor Steven Murphy (At-Large), incumbent Councilor Ayanna Pressley (At-Large), Michelle Wu (At-Large), Michael Flaherty (At-Large), Joshua Zakim (District 8) and Timothy McCarthy (District 5). The NERCC represents over 20,000 carpenters, pile drivers, shop & millmen, and floorcoverers working in the New England states of Connecticut, Maine, Massachusetts, New Hampshire, Rhode Island and Vermont. NERCC is part of the United Brotherhood of Carpenters, one of North America’s largest building-trades unions, with nearly a half-million members in the construction and wood-products industries. UNITE HERE Local 26 represents over 6,500 workers in the City of Boston including most of the major Boston hotels, food service workers on college campuses, convention centers, Fenway Park and Logan Airport. Boston's Local 26 is one of the most politically powerful and diverse unions in the City of Boston. For more information contact Harry Grill, Political Director, Boston’s Local 26 at (617) 838-4201 or Stephen Joyce, Political Director, New England Regional Council of Carpenters at (617) 438-8011. Do I need to wear sunscreen if I am not at the pool or the beach? This is a question we are often asked. Many of you work outside for extended hours and even though it is work and not play, the simple answer is “yes,” you should protect your skin from prolonged sun exposure. Ultra violet rays are linked to an increase in certain types of skin cancers, aging and sagging skin. This includes the skin on the top of your head and the skin under your hair. Especially for those with thinner hair, applying sunscreen or wearing a hat is the healthy choice. Wearing sunglasses with UV protection is also a good way to avoid harmful rays. If I need to wear sunscreen, is applying once in the morning enough to protect my skin? The brand of sunscreen you choose should come with directions on how long it lasts and when reapplication is necessary. As a general rule of thumb, reapply every four hours or after excessive sweating or swimming. Keep in mind that the sun is at its strongest from 11 AM until 2 PM. Sunscreen with a Sun Protection Factor (SPF) of 15 or higher is recommended. There is no evidence that an SPF over 35 is beneficial. While a sleek summer bronze may look good now, its benefits will be long forgotten years down the road if you are coping with skin disease and aging. It does not need to be a top of the line sunscreen spray bottle – it just needs to be sunscreen! If you have a question or are interested in learning more about Carpenters Care please call 1-781-222-0930 or email infoboston@iorahealth.com. The joint task force was created in 2008 as a result efforts by the Carpenters union and others to educate Governor Deval Patrick, state legislators and leaders of several executive branch agencies who enforce laws and policies related to employee misclassification. Tens of millions of dollars in state and federal revenue are lost each year due to employee misclassification while employers who play by the rules are put at a competitive disadvantage and workers are stripped of essential protections such as workers' compensation coverage and eligibility for unemployment insurance, Social Security and Medicare. The issue is especially acute in the construction industry, where the fairness of direct competitive bidding can easily be undermined by a bidder misclassifying employees as independent contractors to save 20-30% on labor cost. Perhaps the largest recent case involved more than $1.1 million in unreported wages found at the renovation of the Boston Marriot Copley Place, where one contractor was paying $4 an hour to employees who were recruited from a substance abuse program in Connecticut. Contractors were issued more than $100,000 in fines on the project. "The work of the Task Force is invaluable in reducing the growth of the underground economy in the state's construction industry,” said Mark Erlich, Executive Secretary-Treasurer of the New England Regional Council of Carpenters. “Taking on the illegal practices of wage theft, misclassification and tax and insurance fraud creates a more level playing field, which ultimately benefits legitimate employers, tradesmen and women and taxpayers." The joint task force brings together various state agencies, including the Executive Office of Labor and Workforce Development, the Attorney General’s Fair Labor Division, the Insurance Fraud Bureau and others. Formerly one of the largest furniture stores on the East Coast, this long-dormant building will once again be a source of pride for the community as the home of the Boston Public School Department. 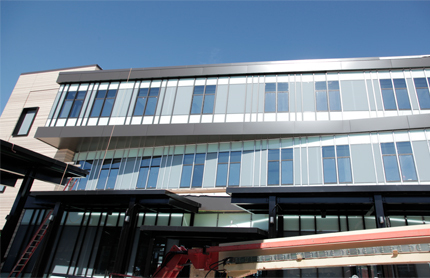 NERCC photographer Ellen Webber visited the site this week to get some updated shots of the project. Learn more about this project by clicking here to watch the Dudley Vision video. The latest issue of New England Carpenter is on its way! Keep an eye on your mailbox, the latest issue of the New England Carpenter magazine will be arriving this week. The issue features a story about the economic recovery slowing spreading across New England as well as a cluster of stories about NERCC members and their involvement in the community. You can read the issue online and find additional content, including links to video content, by clicking here. People in New Hampshire are learning more about unions and the wage and training opportunities they offer thanks to panel discussions being held, which elected officials and Carpenters Local 118 Business Manager Elizabeth Skidmore. The forums focus primarily on the wage gap between men and women and are being sponsored by the NH AFL-CIO and New Hampshire Citizens Alliance, which is 23 cents and hour in New Hampshire and 18 cents nationally. While women are still under-represented in construction, Skidmore points out that wage equality is not an issue in the union sector. In addition to collective bargaining agreements ensuring equal pay, unions also offer apprentice and journey level upgrade classes, which allow for entrance and advancement in the industry. Each of the forums, held in Manchester and Portsmouth, received prominent media coverage, including quotes from Skidmore. Dan Donahue, son of Jack Donahue, who is the Business Manager of Local 107, Regional Manager for Central and Western Massachusetts and Warden for the NERCC, was the winner of a special election Democratic primary election for state representative last night. Donahue will take on Republican Carla Claros in a general election on September 10 for the 16th Worcester District seat, from which John Fresolo recently resigned. It is summer in New England, that means outside work, outside play, and exposure to everything that comes with being outdoors. Lots of people come in to see us with topical skin complaints these days: a rash, a burn, a bump or lump. While the urban legend (probably rooted in some kind of fact) that a bull’s-eye rash after a tick bite is how you diagnose Lyme disease, CDC studies show that fewer than 50% of patients with Lyme disease recall a tick bite and fewer than 50% of patients with Lyme disease recall any rash. So what does that mean for you and Lyme disease? Anyone who works or plays outdoors is at risk. Deer ticks like cool, moist environments like tall grass around the edges of yard or along side roads. They also like moist gardens and shrubs in wooded areas; they can even fall off of trees! The list is endless and so is the risk for exposure even right in your own backyard. Performing daily skin checks, wearing DEET repellent and wearing socks and shoes decrease your risk for tick bites. You should contact your doctor if you have symptoms such as a rash, aches or pains and ask about an evaluation for Lyme. It’s not just a bull’s-eye rash anymore. Learn more about the Liberty Mutual project by clicking here to view it in our online portfolio. Brother Eamonn Murphy left Ireland to seek a career in Boston in the summer of 1998. In February of the following year, he joined Carpenters Local 33 as first year apprentice. From the onset, Brother Murphy showed a thirst for knowledge and has fully embraced the opportunities available to all members of the Carpenters Union. He now works as an Estimator and teaches other union carpenters as an instructor at Wentworth Institute of Technology’s College of Professional and Continuing Education. Read more of his story here. Carpenters Care is a new primary care doctor’s office designed specifically for Carpenters and their families. The practice is conveniently located, features evening hours so that you do not have to miss work, consists of a team that knows who you are, focuses on preventive care that keeps you healthy, requires no co-pays, and excludes all of the hassle of going to traditional doctor’s offices. Carpenters Care is a completely voluntary primary care doctor option, open to members of the New England Regional Council of Carpenters and their dependents age 18 and over who currently have healthcare coverage from the New England Carpenters Benefits Fund. The following video story about Local 33 Brother Eamonn Murphy, a carpenter who has participated in the Wentworth Program as both a student and an instructor was recently posted in the Meet Our Community section of nercc.org. Click here to see more stories. Legendary horror author Stephen King may be looking for a UPP t-shirt. The Maine native was staying in Hartford this week, walked by a union banner protest in front of the Capital Grill, and stopped to ask about it. NERCC Business Representative Dean Pallotti told King that the Capital Grille was being built by contractors that don't meet area standards and were suspected of misclassifying workers as independent contractors. Darden Restaurants owns the Capital Grille chain as well as others, including Longhorn Steakhouse. The company is in the process of building a Longhorn in Enfeild, where there is also concern about contractors being used who don't meet area standards. King extended his support to the union's efforts, saying it didn't seem right since he pays his fair share of taxes. Following is a statement from Mark Erlich, Executive Secretary-Treasurer of the New England Regional Council of Carpenters and Chair of the New England Carpenters Benefits Fund. "As a result of an organizational re-structuring at the New England Carpenters Benefit Funds, Harry Dow has stepped down from his position as Executive Director. We are enormously grateful for Harry's tremendous contributions to the growth of the Funds over the past 24 years and the spirit of professionalism that he personified and that characterized the Funds under his leadership. "Long-time Trustee Steve Adamic has assumed the duties of acting Executive Director. Please direct all calls and correspondence regarding the business of the Funds to Steve. He can be reached by phone at 978-752-1132 or email at sadamic@carpentersfund.org." Attention Eastern MA carpenters: Carpenters Care is accepting new patients! The New England Carpenters Benefit Funds & Iora Health have partnered to offer new primary care doctor's office for members and other adults covered by the Health Fund. The doctor's office convenient after-work hours and has locations in Burlington, MA & Dorchester, MA. Carpenters Care patients, have no co-pays and enjoy free access to fitness & other group classes. Fund participants can join at any time with no commitment and no changes to their benefits. Joining is completely free and voluntary. Learn more about the Carpenters Care team by clicking here. The Narragansett Town Council voted to suspend negotiations with Deepwater Wind, the developer of the renewable offshore wind project proposed for Block Island Sound. Thomas Savoie, representing Local 94,of the New England Carpenter’s Union asked the council to avoid a delay in negotiations due to the potential for the creation of quality jobs. Carpenters Care is open! What is it? A new primary care doctor's office designed for you & your family...Read more on their website by clicking here. Local 275 Business Manager Kevin Kelley recently attended the 39th Annual Mayor's Community Prayer Breakfast held at Boston College. Attending the event with Kelley was retired Local 275 Business Manager Edward Gallagher, a 67-year member of the Local. The breakfast was held on May 29, which was Brother Gallagher’s 90th birthday. U.S. Sen. Elizabeth Warren spoke at the event, which supports religious, ethnic and racial diversity and celebrates people who are making a difference through volunteerism. Carpenters Care available in Eastern Mass. The New England Carpenters Benefit Funds & Iora Health have partnered to offer new primary care doctor's office for members and other adults covered by the Health Fund. The doctor's office convenient after-work hours and has locations in Burlington, MA & Dorchester, MA. Carpenters Care patients, have no co-pays and enjoy free access to fitness & other group classes. Fund participants can join at any time with no commitment and no changes to their benefits. Joining is completely free and voluntary. To become a Carpenters Care patient, call 1-781-222-0930 or go online to CarpentersCare.com to learn more. Volunteers from the Carpenters Union were part of a very special project in South Boston, transforming the home of Sydni Pecevich into a space where she can learn and grow. Sydni was diagnosed with a grapefruit-sized malignant brain tumor when she was just two months old. She had nine months of chemotherapy and eighteen surgeries in her first two years of life. She is now eight years old, and although cancer-free, she was left with disabilities that require 24-hour supervision. As Sydni got older it became apparent that the tight quarters of her family’s home were not sufficient to accommodate all of her needs. The Carpenters Union, along with other Building Trades volunteers, stepped up in a big way to help her family turn her home into a space for her and her siblings to grow. Ten members of the New England Regional Council of Carpenters graduated during the 2013 Spring Commencement at Wentworth Institute of Technology. Five of the graduates received special recognition for academic achievement, listed below. This group of carpenters is the first class to receive bachelor’s degrees. In 2008, Wentworth Institute of Technology’s Division of Professional and Continuing Studies signed an articulation agreement contract with the NERCC to deliver an Associates’ Degree in Construction Management to members of the Carpenters Union. This was Wentworth’s first articulation agreement with a trade union. The program has evolved in the short time since its first inception. The agreement now includes both the Bachelor and Master of Science Degree programs. The Ledwell family, many of whom are Local 56 members, has organized a motorcycle run in memory of Caitlin Ledwell. All proceeds from the event will go to a scholarship in her honor. A benefit will be held after the run beginning at 1:00 PM at the Upland Club. All proceeds from the day’s events will go to the Caitlin Elizabeth Ledwell Memorial Scholarship Foundation. For more information click here. Learn more about the WRTA Bus Hub project by clicking here to see it in our online portfolio. A group of union carpenters from Local 275 in Newton recently got together to help out another local playground. The members built a new perimeter consisting of four side walls at the Franklin Playground as a UPP event in coordination with "Newton Serves." Pictured are members that came out to lend a hand. Back row, left to right: Kevin Kelley, Matt Matheney, Desmond Trainor and Keith Farley. Middle Row, left to right: John McClintock, Rick Scales, Eric MacKinley, John Burrows, Steve Donnelly and Robert Tedeschi.Front row; William Newton. A job well done to five union carpenters who volunteered on a Saturday in late April to help Rebuilding Together Boston as part of their National Rebuilding Day. The members, who participated through the Sisters in the Brotherhood program worked together, alongside 30 other volunteers, on the house of an elderly Dorchester resident. 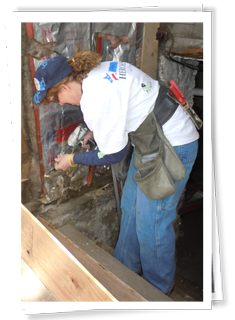 The Rebuilding Together Boston program works throughout the City of Boston to repair and renovate the homes of economically disadvantaged homeowners including the elderly, veterans, families with children, single parent households, the physically challenged, and others in need. The program also assists non-profit-owned facilities- community centers, schools, worship centers, etc. 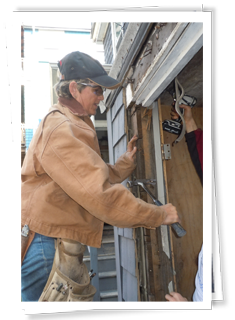 Services are provided at no cost to recipients due to the generous support of foundations, corporations, vendors and individuals like the carpenter volunteers. Volunteers on the Dorchester project rebuilt a bulkhead, replaced a number of windows and two doors, patched walls, hung drywall, rebuilt a portion of the kitchen, replaced window and door trim, rebuilt latticework around the foundation, poured concrete for a new sill to the bulkhead, and much more. Members involved in the effort included Karen Blandino, Local 67; Mary Ann Cloherty, Local 40; Mary Muhler, Local 67; Liz Skidmore, Local 118; and pre-apprentice Kaitlin Medeiros. May Day, also known as International Workers’ Day, commemorates the 1886 Haymarket Massacre in Chicago. Four demonstrators and several police officers were killed during a general strike for the eight-hour workday when an unidentified person threw a bomb at police who were trying to disperse the gathering of people. Police reacted to by firing at the crowd of workers. Today, International Workers’ Day is celebrated in more than 80 countries around the world as a day to commemorate the ongoing fight for workers’ rights. Boston-area gatherings will be held this afternoon in Revere, Everett, Chelsea and at Boston City Hall (start times vary by location). Participants will march from each of these locations to a combined rally at 5:00 PM happening at Liberty Plaza, Central Square, which is located off of Bennington and Meridian Streets in East Boston. NERCC, with help from local community groups, created this video as a promotion for local area International Workers’ Day events. The piece gives Boston-area workers, including Piledrivers Local 56 member Fran Kotak, a chance to share their stories. Check out the full length version of this video here. Visit nercc.org/mayday for detailed information about Boston-area gatherings. With roots in the American struggle for the 8-hour work day, International Workers Day is celebrated in more than 80 countries around the world as a day to commemorate the ongoing fight for workers' rights. Below, Boston-area workers share their stories as part of International Workers' Day, which takes place on May Day (May 1st). May 1st commemorates the 1886 Haymarket affair in Chicago, where workers stood for the eight-hour workday. Join labor unions, faith organizations, immigrant rights groups and community allies as we march and rally for workers' rights. For information about Boston-area gatherings, visit nercc.org/mayday. To see the full-length version of this visit, click here. Learn more about the St. Vincent Cancer Center project by clicking here to see it in our online portfolio. Applications are now being accepted for the 2013 New England Regional Council Scholarship Program. Last year 148 students applied and a total of $50,000 was awarded, including the top prize scholarship of $5,000. To be considered for an award, a completed application package must be received by 5:00 pm on April 12, 2013. What impact does “Right to Work” legislation have on labor unions, economic development and the standard of living in a state that adopt the law? To eliminate bias, the scholarship committee is blind to the identity of the applicant. Essays are numerically coded to prevent any reader from having knowledge of the writer. Winners of the top two prizes will be asked to read their essays at the June 2013 delegate meeting. Persons awarded first or second place in a prior year are ineligible for first or second place in subsequent years. A series of sweeps of construction sites in Connecticut this year has resulted in 27 "Stop Work" orders against contractors for misclassification of workers as "independent contractors." 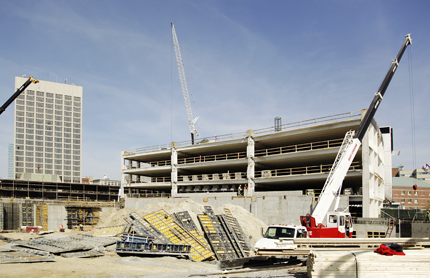 The results continue a disturbing trend in the state's construction industry. In the past year, the Connecticut Department of Labor reports that inspection and review of 108 construction projects and 299 contractors has resulted in 199 "Stop Work" work orders, an alarming rate of cheating. "Some employers will misclassify workers as independent contractors with the intent of avoiding their obligations under federal and state employment law covering such matters as workers' compensation, unemployment taxes and payroll reporting," said state Labor Commissioner Sharon Palmer. "Unfortunately, when an employer fails to pay for the proper coverage for injuries suffered on the job, and a worker gets hurt, the state's taxpayers ultimately foot the bill." Avoiding tax obligations gives cheating employers a significant advantage in competitive bidding and negotiated pricing within the construction industry and creates a funding gap for state and federal governments, among other problems.